There are any number of articles on the web about who you should follow on Twitter. Just type this question into Google and it returns 47 million results! Just about every publication has a recommended list. The first page of results when I just did that includes the UK Daily Telegraph, Forbes magazine, Newsweek, Business Insider and the New Musical Express, each of which has selected Twitter accounts with a particular theme. However if you’re working in Finance then you have a number of problems. The first is that you may not even have access to Twitter while you’re at work – many financial firms block Twitter at the firewall for compliance, regulatory and security reasons. And you almost certainly aren’t allowed to use your personal mobile phone in the trading room or on the trading floor. The second is that even if you do have access to Twitter at your desk, it’s very likely to be provided by a third-party Twitter/News service – which will be curated by the provider. This means you can choose who to follow provided you select from their curated list of approved accounts. So even if you know about the Twitter account of an amazing oil futures analyst who accurately predicts market movements, if they’re not in the approved curated list then you can’t follow them. Some of these services do allow you to suggest accounts to be added – but if the account you want is approved, then every other subscriber to that service can follow them, so you’ve lost any possible competitive advantage you might have expected. 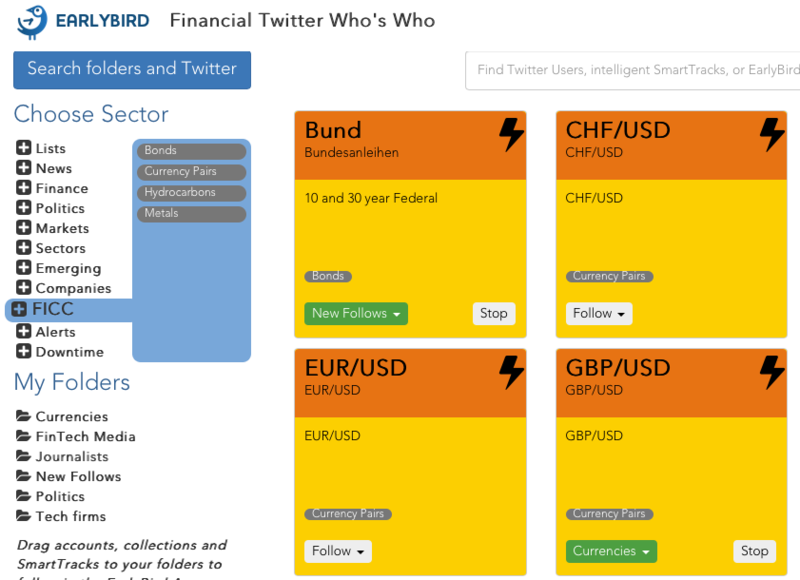 EarlyBird is a fully-compliant, read-only Twitter service for finance professionals that allows you to follow anyone you choose. You can’t Tweet – indeed you don’t need a Twitter account at all. And it’s completely anonymous - no-one can see your account or even the accounts you’re following. So now you do have the problem – who should I follow on Twitter? And EarlyBird helps solve that one for you too. 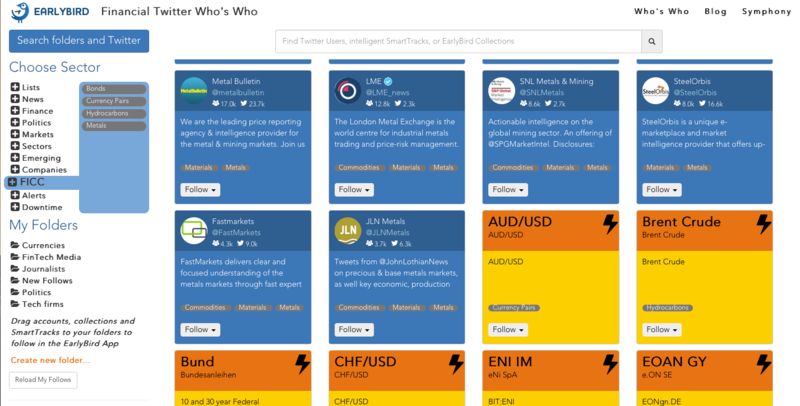 It provides a “Who’s Who” list of financially relevant accounts in News, Finance, Politics, Markets, Sectors, Emerging Markets, Company equities and FICC. It even provides ready-made collections which you can drag and drop into folders on the web page and they’ll appear in your EarlyBird client. EarlyBird’s Who’s Who is available on the web to anyone (example page above) – at least you’ll get some great ideas of who to follow. Of course to obtain the greatest benefit you do need to be an EarlyBird user. Then you can drag the accounts to your own folders, and take advantage of the collections and the Smart Tracks. Smart Tracks are intelligent combinations of pre-selected Twitter accounts and complex search algorithms which means you’ll see relevant Tweets about that particular topic (company, index, currency etc.) in your timeline whether they’ve been posted by one of the accounts you're following or not. And of course EarlyBird’s advanced search capability means you can find and follow that great oil futures analyst, and no-one else will know. That’s how to find who to follow on Twitter if you work in finance.